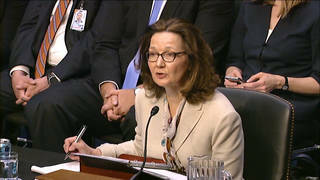 CIA Nominee Gina Haspel May Testify for First Time in Public About Her Role in Torture at Black Site | Democracy Now! senior fellow at the National Security Archive and author of the book The Ghosts of Langley: Into the CIA’s Heart of Darkness. "The Ghosts of Langley: Into the CIA's Heart of Darkness"
The Trump administration’s push to install the CIA’s controversial deputy director, Gina Haspel, as the agency’s new director faces mounting scrutiny as Haspel is set to begin a Senate confirmation hearing this Wednesday. The Washington Post reports the hearing almost didn’t happen, after Haspel attempted to withdraw her name from consideration over opposition to her role in the CIA’s torture program under George W. Bush. Wednesday’s hearing will mark the first time Haspel has been forced to speak publicly about her role in the U.S. torture program and the destruction of CIA tapes documenting the torture. Haspel’s nomination as CIA director has been “sold like a box of cereal” by the agency, says John Prados, senior fellow at the National Security Archive, but with no transparency about her record. As of now, says Prados, there’s no public document listing Haspel’s duties in her more than 30 years at the CIA. AMY GOODMAN: We begin today’s show with the Trump administration’s push to install the CIA’s controversial deputy director, Gina Haspel, as the CIA’s new director. Haspel is set to begin a Senate confirmation hearing this Wednesday. But according to The Washington Post, the hearing almost didn’t happen. The paper reported Sunday Haspel attempted to withdraw her name from consideration over opposition to her role in the CIA’s torture program under George W. Bush. Haspel was responsible for running a secret CIA black site in Thailand in 2002, where one prisoner was waterboarded 83 times and tortured in other ways. The former acting director of the CIA confirmed that in 2005 Haspel personally oversaw the destruction of videotapes showing torture at the black site. Gina Haspel reportedly offered to withdraw her nomination Friday, after some White House officials raised concerns with her about her ability to get confirmed. She was then summoned to the White House to discuss her history with the covert interrogation program. During the meeting, sources says she offered to withdraw. But by Saturday afternoon, Haspel told the White House she would not withdraw. Also Saturday, White House Press Secretary Sarah Sanders tweeted, “There is no one more qualified to be the first woman to lead the CIA than 30+ year CIA veteran Gina Haspel. Any Democrat who claims to support women’s empowerment and our national security but opposes her nomination is a total hypocrite,” Sanders tweeted. Wednesday’s hearing will mark the first time Haspel has been forced to speak publicly about her role in the U.S. torture program and the destruction of CIA tapes documenting the torture. Her nomination has been widely criticized by human rights groups. The American Civil Liberties Union called on the CIA to declassify and release every aspect of Haspel’s torture record. Last year, German prosecutors were asked to issue an arrest warrant for Haspel for her role in the torture program. Prosecutors are said to be reviewing the request by the European Center for Constitutional and Human Rights. For more, we go to Washington, D.C., where we’re joined by John Prados, senior fellow at the National Security Archive, author of about 30 books on international security, diplomatic intelligence, military history. His latest, The Ghosts of Langley: Into the CIA’s Heart of Darkness. John Prados, welcome to Democracy Now! Can you begin by talking about Gina Haspel’s record? JOHN PRADOS: Well, that’s the problem—isn’t it?—is that no one knows Gina Haspel’s record. And everyone is asking the agency to release this information for the purpose of her nomination. And that’s actually one of the basic problems in this whole situation. JOHN PRADOS: We have—OK, sure. We have pieces of documents that identify Ms. Haspel with two specific events, one of them being the torture at the site in Thailand that you mentioned, and the other being the instructions issued by the CIA operations director, Jose Rodriguez, to destroy videotapes that documented CIA torture. At that time—at the later time, she was the chief of staff to Mr. Rodriguez. So, the documentation that we have has excised from it—this is typical in declassification work—the names, the information, the words that would identify in fact what Haspel’s exact role was in this situation. And, of course, there would be surrounding documents, like conversations between high-level officials at the agency talking about the result of the destruction of the videotapes, as well as documents that we don’t even know about yet that concern Haspel’s efforts in Thailand and as chief of staff. AMY GOODMAN: —and was jailed for nearly two years. Kiriakou personally knew Haspel when he worked at the CIA. This is what he said. JOHN KIRIAKOU: We did call her Bloody Gina. Gina was always very quick and very willing to use force. You know, there was a group of officers in the CIA’s Counterterrorism Center, when I was—when I was serving there, who—I hate to even make the accusation out loud, but I’m going to say it: who enjoyed using force. Yeah, everybody knew that torture didn’t work. That’s not even the issue. Lots of different things work. Was it moral, and was it ethical, and was it legal? I think the answers to those questions are very clearly no. But Gina and people like Gina did it, I think, because they enjoyed doing it. They tortured just for the sake of torture, not for the sake of gathering information. AMY GOODMAN: So, that’s John Kiriakou, who knew Gina Haspel at the CIA. John Prados, if you can elaborate on what he has just said? JOHN PRADOS: Well, it’s actually a very important point to make, because all of this malarkey about putting a woman at the top of the CIA disguises one of the main problems here, which is that what we’re talking about is the head of an agency who faces outwards to the entire world. And if we put in place a person who is an acknowledged torturer, then the message that we are sending the world is that America is not your friend, America is not someone that you want to cooperate with. And the problem with this whole question of the secrecy of the documents and all of this is that no one outside the rarefied, classified levels of this secret society, if you want to call it that, knows what the story, the real story, is with Gina Haspel. So the consequence of that is essentially that the Senate is being asked, the American people are being asked, to accept a pig in a poke. AMY GOODMAN: Which is why the American Civil Liberties Union has filed a Freedom of Information Act request seeking documents relating to the CIA’s efforts to get the Senate to confirm Gina Haspel as CIA director. The CIA has said it’s being, quote, “more robust than normal” in supporting Haspel’s nomination. This includes a string of enthusiastic tweets and press releases endorsing Haspel’s record. ACLU attorney Dror Ladin called these efforts propaganda, saying, “For years, the CIA waged a propaganda campaign to mislead the American public and its elected representatives about the CIA’s brutal and unlawful torture program. … The American people have a right to know about the new propaganda campaign that the CIA is now waging on behalf of Gina Haspel even as it hides her responsibility for torture and role in destruction of torture evidence.” That’s what the ACLU is saying. And, of course, Gina Haspel is now acting head of the CIA, so she is in charge of what gets out and what doesn’t. You, John Prados, have written that the confirmation hearing would actually be an important event to get information out, if in fact you believe Democrats or Republicans will ask about her role in torture. JOHN PRADOS: Well, actually, and let me add to what you just said. I work for the National Security Archive. We have also filed suit for those documents. And so, there’s widespread efforts to open up the record. I don’t think any of this is going to happen, though, before the nomination hearing. And that’s part of our problem. In any case, I want to also add to the conversation about the director of the CIA being sold, actually, like a box of cereal. For example, to this day, this morning, there is no publicly available document that even tells you what were Gina Haspel’s duty stations during her 30-year career at the CIA. We know the things that we talked about earlier in the program, and that’s almost the only open information that exists. There was actually a CIA release that gave some details about Ms. Haspel’s career. But if you went to the CIA’s website, you could not find that document. That’s how open the agency’s approach to informing the American public on this is. AMY GOODMAN: How different is her nomination process from other high-level intelligence officials’ nomination processes, like Michael Hayden, Porter Goss, George Tenet? JOHN PRADOS: Very different. The standard has always been that there is a high degree of detail, a high degree of inquiry, applied in one of these situations. The nominee fills out an extensive questionnaire. This is made available to the public. The nominee appears at hearings, both open and private, and answers questions to the record—questions for the record. And all of that becomes a package that’s available to the American people. Ms. Haspel is going to go to her nomination hearing, as of now, without the public even being aware of what her duty stations at the CIA were. AMY GOODMAN: And when you heard on Friday that she might withdraw her nomination, or the reporting in the Times she might withdraw as a candidate, what were your thoughts? What do you think this means? And even if she did withdraw or wasn’t approved, she could stay as head of the CIA for as long as President Trump doesn’t nominate or a nomination process goes forward for someone else, right? JOHN PRADOS: That’s actually correct, yes. But let me go back to my thoughts. My thoughts were, this shows that, in fact, they’re starting to understand that there’s a problem here. I think, initially, they might have thought that they could just waltz through this process and not pay attention. But when people started asking for information, they began in a posture of denial. And then, as they have come closer to the sort of moment, they’re beginning to realize that this is a much more complicated thing than they thought. AMY GOODMAN: —has written many books on intelligence and security. Thank you, John. AMY GOODMAN: His latest, The Ghosts of Langley: Into the CIA’s Heart of Darkness. This is Democracy Now! When we come back, with the ending of the temporary protective status for Hondurans, is President Trump ending TPS altogether? Stay with us.